I'm never without my purse in Real Life, and if you're a woman, Dear Reader, I bet you aren't far from yours, either. So why don't we wear purses in Second Life? Well, for one thing, we don't have to! Everything, INCLUDING the kitchen sink, is right there in our inventories, no matter where we go. So there is no need for a bag. One could make the argument that the Inventory is the Handbag, Done Right, were it not for the fact that one's inventory is not much of a fashion statement. For another, the darn things are useless. They can't actually hold anything. Anyway, see above. The inventory does a much better job of that. But there are times when I've wanted a purse or a handbag in Second Life, just as an accessory to complete or complement my outfit. And yet, most bags are a terrible nuisance. They only look good in one particular pose, and if you change your stand (or worse yet, fly or sit) they just look silly, sticking out in some unlikely direction. Even if the bag has a "bag hold" animation, it's more than likely that your animation overrider will, um, override it. But the other day, I finally found a bag that looks good...not only on the store shelf, but when worn. 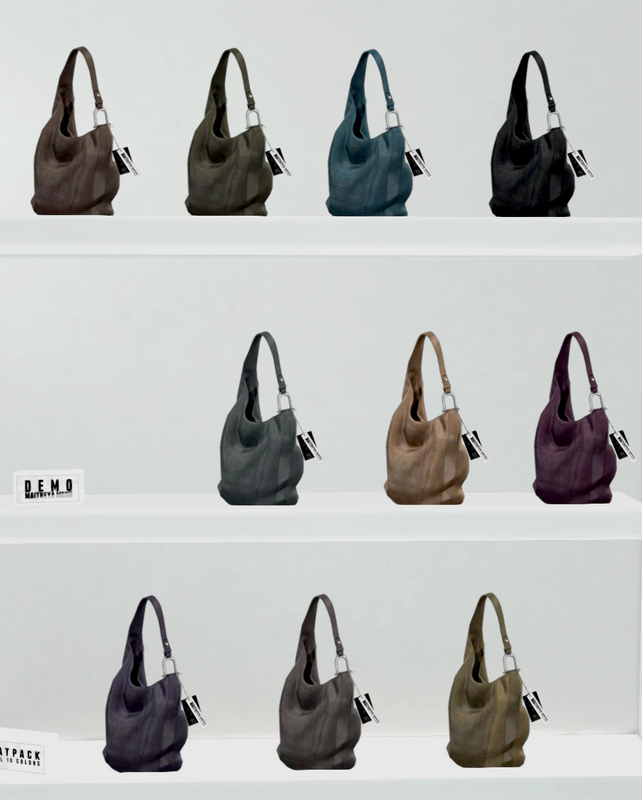 It's the Satchel Bag by Maitreya, and it comes in a variety of colors to go with most outfits. It's Mesh, and it has a slouchy, weighty appearance and a beautiful pebbled leather texture. Best of all, it's versatile. It comes with four different versions -- carried in the hand, carried on the forearm, and both a rigged and a non-rigged shoulder carry version. All the bags are editable except the rigged mesh shoulder version. Each version has an appropriate "bag hold" animation, and wonder of wonders, they work with my SEMotion AO poses. Well, almost...when my AO switches stands, it overrides the bag hold, but a quick switch off and on again brings it back. If the satchel bag isn't your preferred style, there are a couple of options you can explore...not the bags themselves so much (although there are thousands in the Marketplace! ), but carry poses that will work with your AO. Vista Animations has some AOs now that include handbag poses for your arm, and SEMotion has a set of stands that are designed for use with a bag. And SLink makes a pose for their mesh hands that's specifically for carrying a purse. For those times when your outfit just cries out for a handbag as the final touch, I recommend the Maitreya Satchel Bag. Getting Started in Second Life...an Update!